Since 1987 the company has worked in more than 150 custodial institutions, with over 250,000 offenders and people at risk, delivered training to over 20,000 people and performed at 750 criminal justice and social welfare conference events. Geese Theatre Company was established in the UK by Clark Baim, in 1987. Clark had toured extensively in the USA with the original Geese Theatre USA, a touring company established in 1980 by John Bergman. Geese Theatre USA visited hundreds of prisons and paved the way for a great deal of innovative arts-based work in America. Although the two organisations have been separate since 1997 we owe a debt of gratitude to John for providing the foundations on which much of our current work is built. 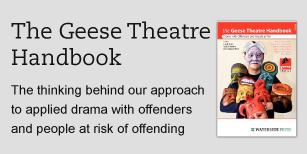 25th January 1989 – Geese host the national Arts and Crime Conference – a national conference on the role of the arts in crime prevention and reducing recidivism – including performances by Geese Theatre Company, Clean Break and Motionhouse, with a keynote address from Ian Benson, Chief Education Officer for HM Prison Service. The content was very relevant and the performance was very engaging and inspiring. Meant more to me than listening to someone speaking.